You may call me crazy, and I may be. I just feel that my 196 pulls stronger at the same setting with R than it did with Q. Granted I started the season with R and had about six months to forget what Q felt like, but I've had to back off from C2 that I've used for four years. Has anyone else experienced this? Isn't there a new Plus+ setting? Do you have the Plus+ engaged? Isn't the plus designed for 220+ pound skiers? @Chuck_Dickey I've seen 120 pound women do quite well with some of the plus settings as well. The additional settings offer a different pull. I suppose the expectation is that "heavier" skiers would like it better but I think it all depends on your objectives. Well despite all the good information, I'm still asking if anyone feels that the same setting, on the same boat, is different from Q to R? Flashed the chip to "R" on the '09 196, not different at all if no "+", imo. @LeonL I'm going with no difference. I had Q on my CC200 all winter long representing over 200 sets at B2. I upgraded to Rev. R in May, skied on it the next day, and noticed absolutely no difference at B2. Supporting this is the fact that according to Will Bush's presentation to USAWS, the algorithm for A-C, 1-3 did not change. 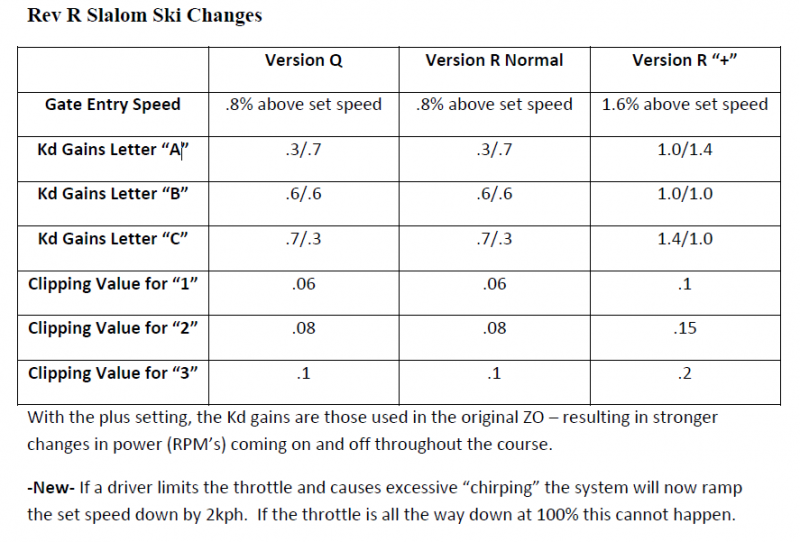 I did not notice any change when we installed Rev-R. We do see though when in plus mode overall times to be substantially faster all the way through the course. particularly with a light skier. What I like about the Plus is it is stronger, BUT it seems to come on stronger slightly LATER...This has allowed me a mlli-second more time to get from the hook-up to the leveraged position...I have picked up several buoys because of this and think it is great. No change noticed with the regular settings on my CC200 6L or my ski partners CC200 5.7L..In fact both my ski partners did not like the plus and are back at C1. @LeonL I did not notice any change from Q to R on my usual setting of B2. All in my head then I would guess. Thanks for the input. I seem to get 16.93 and 16.92 consistent course times with the plus setting. Not that .03 is a huge deal, but I wonder if anyone else has this experience? @ScarletArrow. I have seen the same thing when a skier request the plus setting and they are not what would be considered a heavy skier. Can this circumstance be considered a advantage to a skier? How many new men3 are out their that would prefer to ski a firmer 34? could it be considered pattern driving if say a skier changes back to normal (non plus mode) at their hardest pass? At 36 mph I have seen end course times 03-05 with light skiers in plus mode. “Humor is reason gone mad.” Marx. Skied R version for first time this weekend in a tournament, and it was the best that ZO has felt to me. Opened with C3+, then dropped to C2+ for the next pass and stuck with that both for the Nautique and the MC. Normally I go with C2, the + made it much smoother feeling, and I felt less hit from the boat. Like @Jody_Seal said, I pulled a 135 lb 14 yr old at 36 with C2+ and ran consistent 16.05s. 16.08 with no +.